In my opinion, that's the biggest value of data visualization - the ability to "snapshot" the landscape quickly, and start driving actionable strategies. With a lot of clients or busy days, this is incredibly important. cognitiveSEO's Site Explorer is the quickest way to inspect a site's backlinks profile. You get near real-time information on the freshest inbound links, dofollow vs nofollow links, domain authority, anchor text, sitewide links, live and lost backlinks, referring domains as well as broken links and pages. You can explore trillions of links right away and analyze historical backlink profile data to find big growth opportunities. The link profile of your website is subject to change. We are one of the few backlink checker tools to provide up to 5 years of historical link research data. 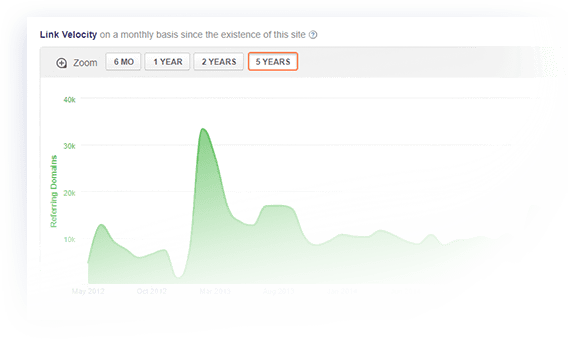 Our open site link explorer gives you the opportunity to understand a site's backlink profile growth trend. Also, having access to all your competitors' backlinks allows you to prospect for new and valuable link building opportunities. Want to see what keywords are you or your competitors ranking for? You can now analyze competitors and compare yourself with them on the spot. Having access to the historical SEO visibility of any website you can boost your rankings by analyzing the top keywords or spot penalized sites in a heartbeat. Not to mention that our analysis tool will give you organic search traffic data along with traffic and search engine volume. Every piece of data from our site and backlink explorer is fully actionable. From a technical SEO perspective, if you want to explore links, do competitor analysis, check link metrics or signals, our backlink checker tool will provide you with valuable & actionable opportunities. cognitiveSEO combines the best link data with some great innovations, creating a truly ambitious and elaborate SEO Technology. Well done! SEO Professionals know how important referring domains are. cognitiveSEO offers you access to a powerful SEO section, entirely dedicated to referring domains analysis. Having all your referring domains and sitewide links along with the essential data for all them, that’s magic. Not only do we offer you a list of all your referring domains & inbound links, but our backlink research tool gives you the possibility to check out each and every one, to see the influence each has on your overall website's profile. Can I view Rank Tracking Statistics in the Site Explorer? The Rankings section shows you the SEO Visibility for both your site and competitors. We also offer you the possibility to view instant and comparative rank tracking statistics for your site and competitors. 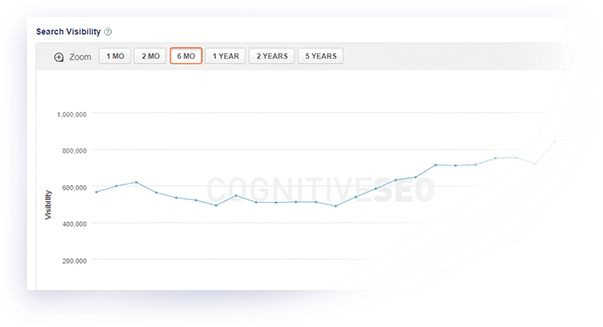 You will be able to check both the historical ranking trend (up to 5 years) as well as the top keywords that the site is currently ranking in the SERPs. More info about the importance of the SEO Visibility can be found here. How is cognitiveSEO's Site Explorer different than the other backlink checker tools? The cognitiveSEO's Backlink Checker Tool is powered by one of the largest link index database. We provide both historical backlink & rank tracking data. 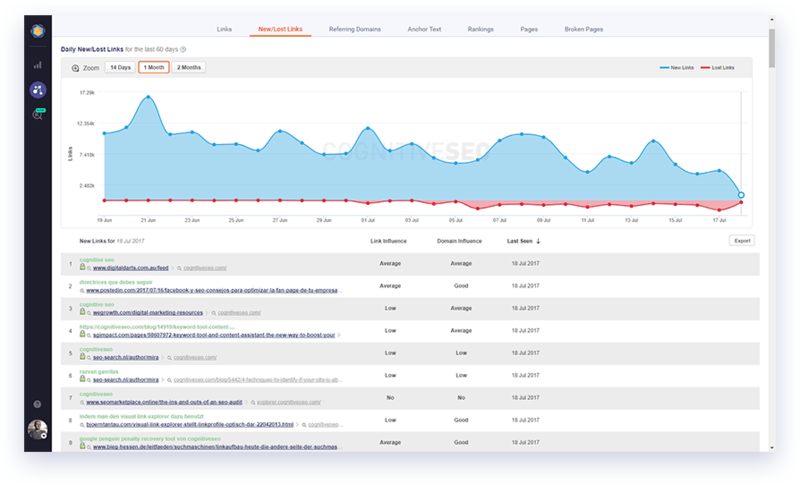 By offering in-depth, yet interactive and easy to understand backlink data statistics, our Site Explorer is great for pitching new clients, spot sites penalties, do competitive analysis, link audits or get accurate rankings reports. It's an all inclusive SEO and link research tool that offers you a bird's eye view for any website or niche. Is Site Explorer included within any cognitiveSEO subscription? Yes, the Site Explorer is included within all cognitiveSEO's subscriptions. More info on the number of credits you get for each subscription can be found on our plans & pricing page. What else do I get if I buy the Site Explorer? The Site Explorer comes together with a suite of SEO tools to monitor both your site and your competitors, do keyword research, track keyword rankings and do content strategy, everything at a fair price. 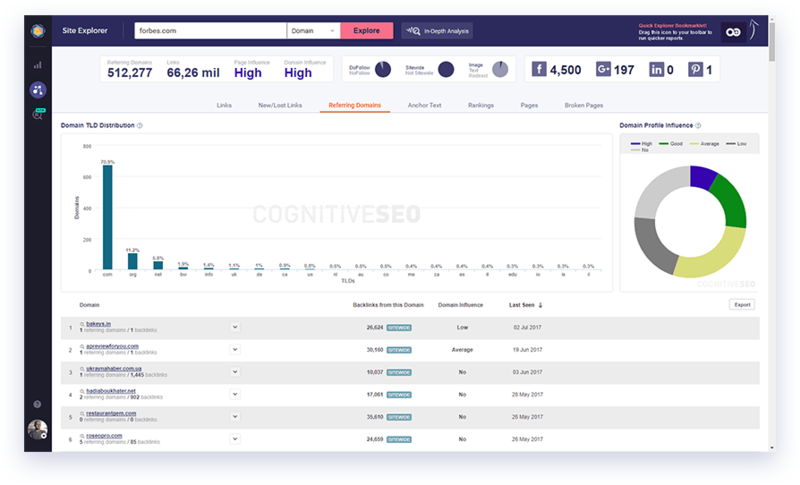 Lots of SEO Companies, SEO Professionals, Content Marketers and Small Business Owners use the cognitiveSEO suite on a daily basis.